Teaching Play Skills - I Love ABA! Play skills can sometimes be seen as unimportant, or delegated to the bottom of the list of important skills to teach to a child with Autism. I often observe many play skill deficits in my clients during the assessment or initial interview, such as the child shoves every toy I hand them into their mouth, the child doesn’t play with toys as designed, the child refuses to share, the child can only attend to a toy for a few seconds, etc. I do understand why for most parents skills such as language, toilet training, and appropriate behaviors are deemed the most important skills to teach. However, I would advise being sure to teach your child how to play. Play skills affect a variety of learning situations, and a child who cannot play appropriately will have a very hard time making social connections with other kids. This is because for children, much of their communication and interaction occurs through play. Small children don’t introduce themselves, shake hands, exchange business cards, and begin to debate the state of the economy. A child walks up to another child, starts to play with them, and a friendship is born. If your child lacks appropriate play skills they might be at a social disadvantage, as well as have difficulty with basic concepts such as: sharing/negotiation, conflict resolution, turn taking/reciprocity, manners/rules, etc. 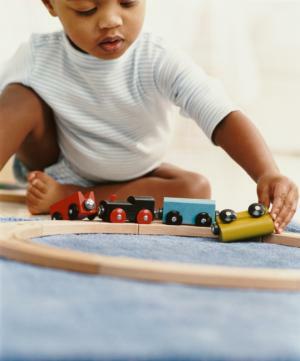 Small children often learn these basic concepts through the intricate complexities of play. Solitary play- Carrie will play or engage with a toy, as long as no one sits next to her or tries to interact with her. If someone tries to sit down with Carrie, she turns her back to the person or scoots away. If the person tries to touch her toy, she gets up and walks away. Parallel play- Carrie will play or engage with a toy while in close proximity to other children or adults, and sometimes she will look at how the other child is engaging with their own toy. Mainly, Carrie focuses on her own toy and does not interact with the peer or adult. Interactive play- Carrie will share a toy with a peer or adult, and will take turns appropriately. This could include passing a toy back and forth, or imitating each others play. Carrie may still play silently, or avoid eye contact with the other person. Cooperative play- Carrie will play and engage with another person, while playing with separate toys or sharing one toy. Carrie will look at the other person and make eye contact. This could include building a block tower together, or working together to solve a puzzle. Pretend play- Carrie will engage in imaginative play (either alone or with others) that involves elements of pretend. This could include cuddling a doll and pretending the doll is crying, cooking a pretend meal using Play-Dough, or playing dress up (Dress up play should include an understanding of the character. Such as putting on a fireman hat and pretending to be a fireman). Rule based play- Carrie will play highly social and competitive games with other persons, such as sports, board games, card games, and video games. Carrie can also play games that other children make up on the spot and can easily adhere to rules of the game that constantly change. You can likely view these basic definitions and already see where your child is in their play skill development. Depending on the specific deficits your child has, they may move through the play levels easily. For other children, they stall at certain play levels or skip some play levels altogether. What is most important is to look at children the same age as your child, and closely observe their play and compare it to how your child plays. When teaching play skills it’s helpful to create a plan of implementation. Approach play skills just like any other skill you would teach. Set concrete, small goals, determine how you will measure progress, and embed reinforcement into the task. Yes, you may need to contrive motivation for play. 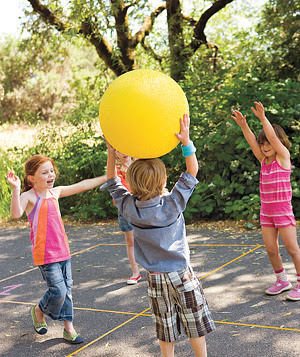 It is typically easier to teach play skills with an adult first, before bringing in peers. Adults are more predictable and less demanding than children, and for this reason children with Autism may easily play or interact with adults but avoid, hit, or refuse to play with other children. It is best to start teaching play skills with simple cause-and-effect toys, such as a Jack in The Box or a keyboard. Avoid imaginative, work based, or complex toys, such as puzzles, figurines, dolls, or Play Dough. If you hand a child with no play skills a lump of Play Dough, they will likely try to eat or lick it. Many people don’t realize it, but strong imitation skills are a pre-requisite of pretend play. A child who cooks a pretend meal, or comforts a “crying” baby doll, is a child who has observed someone else perform these actions. In order to teach play skills, you should model a happy and excited affect. The child is observing not just the play skill, but your face, voice tone, and mannerisms. Make sound effects, clap, laugh, smile, look at the child's face frequently, speak in funny voices, yell, and cheer as you play with the child. It is so important to minimize problem behaviors during play. If the child is engaging in vocal or motor stereotypy, crying, trying to escape, or being aggressive when you are trying to teach play skills then that could stall progress. Conduct a FBA to determine the function of the problem behavior and create a behavior plan. Work on these behaviors in the bud before introducing peers into the play sessions. Talk during play. Children typically talk while they are playing (even if they play alone, they still narrate what's happening). Congrats on starting ABA with your son, I hope you find the therapy to be beneficial! You are right! Play should be considered as one of the important activities in a child's schedule. Incorporating Play activities in ABA therapy will help better in a child's development. I completely believe in the necessity of play for children and their development, and it can definitely be incorporated into ABA treatment.